The first step in making the bridge is to cut all the blanks to the proper length. 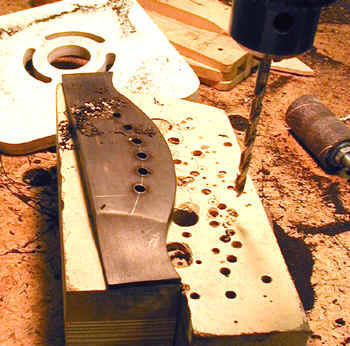 As with many aspects of guitar building, it is time-effective to do a whole batch at once. 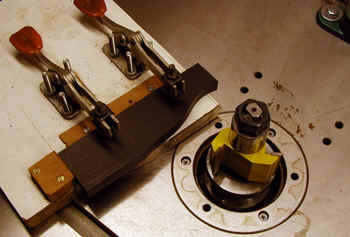 The basic outline of my bridge is cut on the spindle shaper, and there is photo of this jig HERE. Here I am using the spindle shaper to cut the profile of my "belly bridge." The jig is one sided - I cut one side and then flip the blank over to cut the other side. This automatically makes a symmetrical blank. The pyramid bridges are quite different. I have started a page on that process HERE. After this is done, I rough shape the top of the bridge on my belt sander. The shape is curved both side to side and from to back, and by a bit of careful "rolling" I can come quite close. After the basic shape is created I sand the ears of the bridge to the correct thickness. 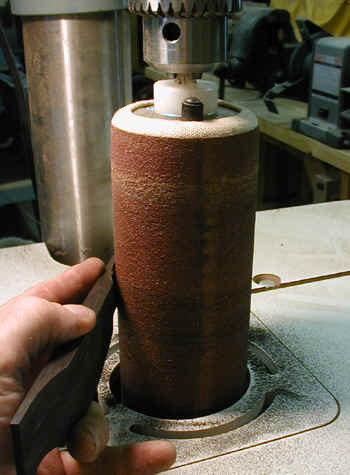 The curvature of the ears is created by the drum sander (which is simply a large drum mounted in my lathe). This sander can be set up with finer grits than the sander in my lathe. I use it to finish sand various parts of the bridge. 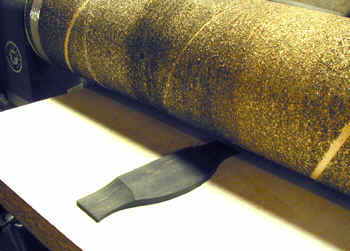 By varying the degree to which the drum is inflated, and thus its "hardness", I can use this for flat surfaces (as shown here) or for curved surfaces such as the top of the bridge. These days I use my oscillating spindle shaper for much of the shaping of the bridge. Works wonderfully. I love this tool!! 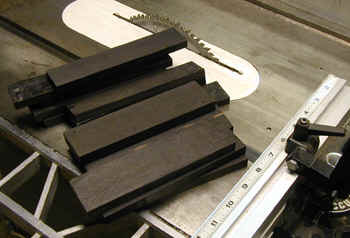 The belt sander is used for some more final shaping, and then a small amount of hand sanding will complete the bridge. After the bridge is shaped, I drill the holes. I use an arc to lay out the pin holes for two reasons. First, I like the look. Second, it may help to prevent cracked bridges of all of the pin holes are not on the same grain line. This may or may not be a real advantage. The next steps are on the next page about gluing a bridge in place. This website and all of its content, text and images are copyright ©1997-2012 by Charles A. Hoffman. All rights reserved.